Want to grow those stubborn calves? Study the 6 most important calf-building concepts you need to know before stepping back into the gym! Go up on to your toes...all the way up. Congratulations, you've just done a calf raise. Over the course of your training career, it may take you 60,000 or more such repetitions with weight across your back to beef up your lower legs. Nobody said you'd get there overnight—the same as with your chest or arms. You've got to put in the work to see the results, just like everybody else. But if you start today, you're one workout closer to achieving your goal. What are some of the best lessons on calf training to ensure you're on the right track? Let's take a look at the six most important concepts. 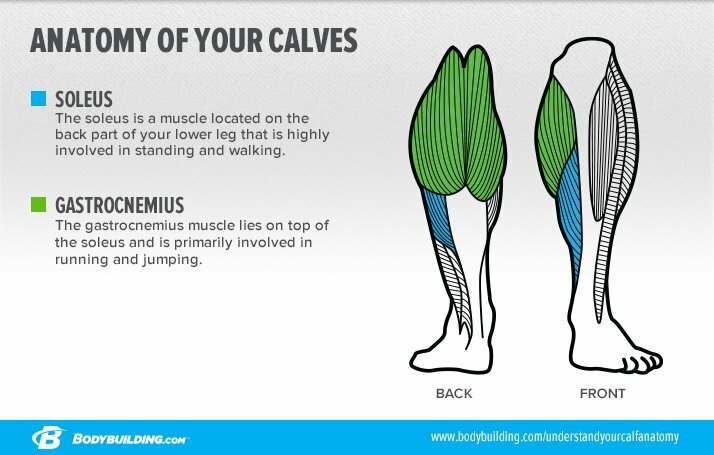 There are two main muscles in the calves: the superficial gastrocnemius, which has two distinct heads and bunches up when flexed; and the slightly wider soleus, which lies directly underneath the gastrocnemius. There are also a few smaller muscles involved with calf-raise movements, but those two larger calf muscles account for a majority of the action. What's especially important to know about the gastroc is that it attaches both above the knee joint and below the ankle joint, and thus has an action at each end. That's why the gastroc is involved in a number of lower-body exercises, including squats. When the knee is bent, as when doing seated calf raises, the gastroc is unable to fully stretch—and, therefore, unable to strongly contract. In these bent-leg movements, only the soleus is targeted. When the leg is fully straightened, however, the gastroc is brought back into the action. Straight-legged calf exercises like the standing calf raise and donkey calf raise work both the gastroc and soleus. You can either begin your calf routine with a straight-legged or bent-knee movement, but the obvious choice is to start where the greatest amount of muscle is involved. Conversely, if you start with seated calf raises and fatigue the soleus, guess which of the two calf muscles is going to give out first when progressing to straight-legged movements? You can do calf raises on a machine, leg press, sled, or hack squat—they're all pretty much the same. Just choose the one that feels right for you. Do be sure to rotate exercises regularly—nothing breeds staleness more than doing the same exercise with the same weight forever. You can do calf raises on a machine, leg press, sled, or hack squat—they're all pretty much the same. Just choose the one that feels right for you. Align your foot, knee, and hip, and use a hip-width stance with your toes pointing forward or angled just slightly out. All future variations of foot position are based on this basic foot position. Don't lock out your knees on straight-legged movements; this can put stress on the joint. Keep your knees unlocked, but maintain them in a nearly straightened position throughout the set. Place just the balls of your feet on the platform; your heels should be free to move through a full range of motion. Lower as far as possible to gain a full stretch in your calves and Achilles tendons. Don't bounce at the bottom of the movement; reverse direction as smoothly as possible. Extend up as high as possible on your toes, holding the peak-contracted position for a count. Adjusting your foot position can slightly alter where the stress is focused on your calves. Turning your feet slightly inward better focuses on the insides of the calf musculature, while turning your feet out shifts it to the outer areas more. Using a variety of foot positions can be helpful in maximizing calf muscularity. That being said, exaggerating those foot positions places additional torque on your knee joints. Always turn not just your feet but also your knees—and, obviously, your lower legs. Premium Formula to Fuel Endurance, Hydration, and Recovery. Go Now! A select few individuals can thank Mom and Dad for their perfect calf genetics. Everyone else will need to put in a lot of work, because calves, like forearms, tend to grow more slowly than other body parts. Why the big investment in effort for such small returns? For one thing, the calves—especially the soleus—are made up of a greater percentage of slow-twitch muscle fibers than other muscle groups, and with good reason: Calves need to keep us on our feet all day long without excessive fatigue. The downside is that those fibers are truly stubborn when it comes to making them grow. For some competitive bodybuilders, developing their calves to match the rest of their body is their biggest challenge. The calves—especially the soleus—are made up of a greater percentage of slow-twitch muscle fibers than other muscle groups, and with good reason: Calves need to keep us on our feet all day long without excessive fatigue. Do a few 10-rep sets of an exercise and a few more 20-rep sets with lighter weight. Employ techniques such as dropsets, rest-pause sets, half reps, and supersets. Speed up your reps as it starts to burn. Hold the peak contraction for a long count. In a word, experiment! New ideas are as easy to discover as looking online at Bodybuilding.com's exercise database or one of our forums. Try different methods to see what, if anything, will turn those calves into cows. 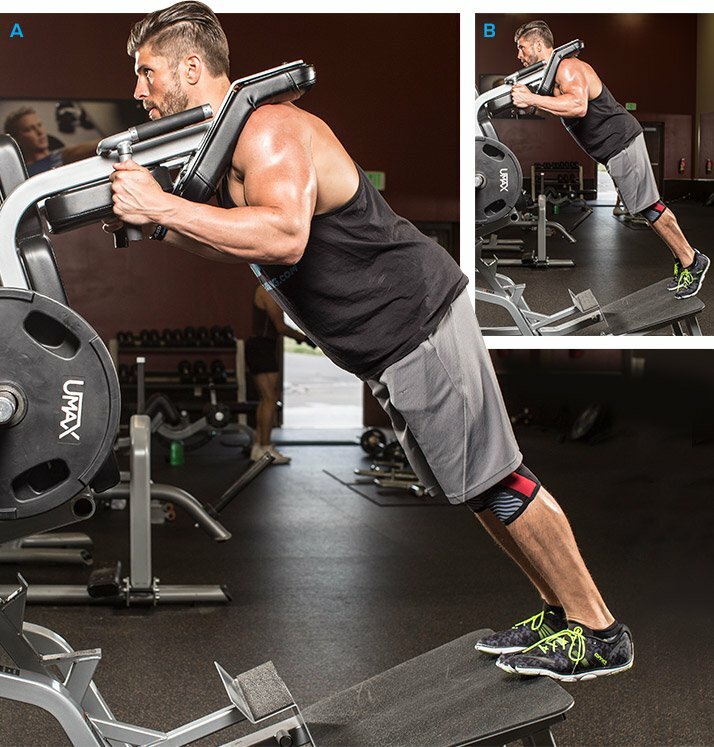 Because the seated calf raise all but eliminates the gastrocs, save this movement for the end of your calf workout. Feel free to vary your foot position here as well; just make sure you slightly turn your knees in or out as well before jamming them under the knee pad. The soleus is an endurance-type muscle, so to fully tax it, you might have to pursue a slightly higher rep range than you did with straight-legged movements. Because the gastrocnemius is involved in a number of lower-body multijoint exercises, the last thing you want to do is train calves before thighs. However, they can easily be done at the end of your leg-training workout. Like other small muscle groups with a greater percentage of slow-twitch fibers, the calves recover fairly quickly after an intense workout. They may be sore for a day or two, but then you're ready to train them again. Experiment with different training frequencies of anywhere from twice a week to as much as every other day, at least for the short term. Keep track of your progress, because you may have to experiment with a number of training variables when it comes to calves before settling on the ones that work most effectively for you. Few bodybuilders will claim it was easy to make their calves grow. More likely than not, you'll have to take a kitchen-sink approach that leaves them so sore it feels like there's fire burning in your veins. If you're doing it right, you should have trouble even walking for the next few minutes. This workout doesn't include warm-up sets. Do as many as you need, but never take warm-up sets to muscle failure. Choose a weight that allows you to reach muscle failure by the target rep.
On the second and fourth sets, include an intensity-boosting technique of your choice to keep the set going past muscle failure.